IT MAY take two coaches to fill the void left by Darren Lehmann, with Cricket Australia set to strongly consider the merits of a revolutionary revamp. Lehmann was contracted until 2019 but opted to quit after watching Steve Smith's emotional press conference on Thursday night at Sydney Airport. Australia's fourth Test against South Africa, starting in Johannesburg on Friday, will be Lehmann's last game in charge. The team's next assignment is a ODI series in England that starts on June 13. CA will conduct a wide-ranging review of team conduct and culture before starting the search for Lehmann's successor, with former Test opener Justin Langer the clear favourite. However, there could be more than one replacement. 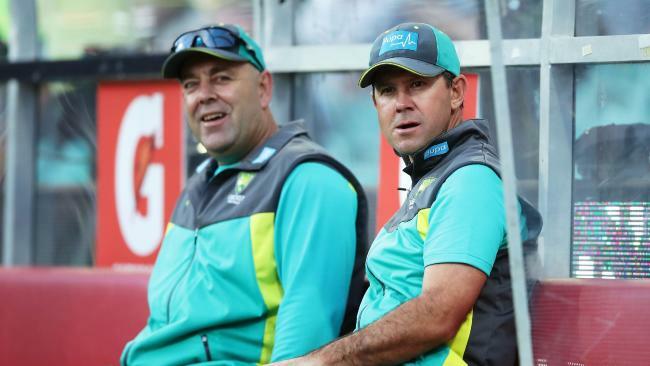 Lehmann has previously proposed a coaching model in which somebody takes charge of Australia's Test squad, while another mentor is responsible for the ODI and Twenty20 teams. "The way that the game (and schedule) is going, you've got no choice ... and cricket is really getting specialised," he said last year. Many influential figures at CA believe the idea has a lot going for it - Ricky Ponting had already been sounded out as a specialist T20 coach. Whether Ponting could be convinced to also take on the 50-over responsibilities is unclear at this stage. 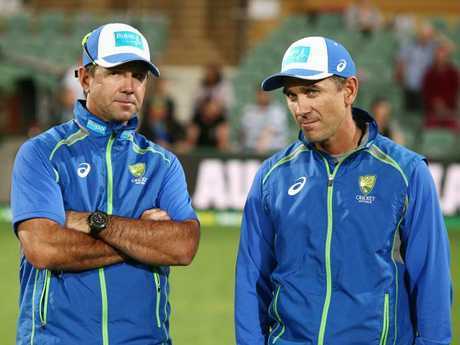 Former English captain Michael Vaughan wrote in The Telegraph: "Australia should now pay whatever it takes to get Ricky Ponting and Justin Langer to take over and sort out the mess. "Both are hugely respected, have great cricket brains and are passionate about their country. They will be desperate to help, I am sure." Settling on a new coach is now arguably CA's most important decision as it seeks to rebuild the team's culture and restore the public's faith. Next year will be an incredibly important test of Australia's approach and ability, with England hosting the World Cup and an Ashes series. CA chief executive James Sutherland isn't keen to rush any decisions. "We don't play any international cricket for a few months," Sutherland said. "We've got plenty of time to work through that. I know there's a lot of talent in the coaching ranks back in Australia. "Among international cricket there are a lot of Australian coaches that are performing very well." Lehmann's tearful departure arguably adds further weight to his argument. Lehmann is among many members of the touring party left mentally exhausted by an intense stretch dating back to the start of the Ashes. "After speaking with my family at length over the last few days, it's the right time to step away," he said. "They've had enough of (me) travelling 300 days a year and not being home at all to see your family, so that's also a big reason. The main reason: "Life on the road means a lot of time away from our loved ones." Long been earmarked as Lehmann's successor. Most people expected the baton to be passed after the 2019 Ashes, but the cheating scandal has thrown the plans of Cricket Australia into chaos. The former Test opener coached the national side when Lehmann skipped a ODI tour of the West Indies in 2016, and he has mentored Western Australia in recent years. He once described the role of coach - when it comes to managing behaviour - as a mix of policeman, headmaster, parent and mate. CA has long wanted the nation's all-time leading run-scorer to coach more, but Ponting has been reluctant to spend time away from his young family in recent years. Lehmann's outpouring of emotion after he and his family "copped a lot of abuse over the last week" may do little to change that mindset. The former skipper has been floated as the nation's Twenty20 coach, having done a stellar job in a couple of short-term consultant stints plus won an Indian Premier League title with Mumbai. The current crisis may prompt James Sutherland to split the job in two and appoint a red-ball coach and white-ball coach. 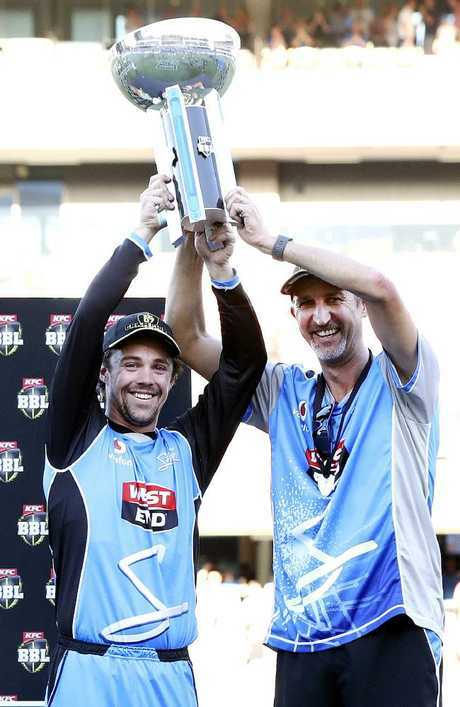 Coached the Adelaide Strikers to their maiden Big Bash League title earlier this year, and he has also served as a consultant coach for CA in the past. The former Test paceman, who played alongside Lehmann for both South Australia and Australia, recently insisted he had every intention to honour a three-year deal with English side Sussex. Lehmann's resignation might force a rethink from Gillespie, who went close before ultimately losing to Trevor Bayliss in the race to be England's new coach on the eve of the 2015 Ashes. Contracted to coach England until 2019, but could come up in discussions - especially if there is a white-ball gig to fill. England was smashed 4-0 in the recent Ashes, but belted Australia 4-1 in the ensuing ODI series and is set to be World Cup favourites when hosting the tournament next year. The Goulburn-raised coach is highly respected by many Australians in the Test XI, having mentored NSW and the Sydney Sixers in the past. Lehmann suggested his side, desperate to clean up their image and win over the Australian public, could do a lot worse than behaving like New Zealand. If Sutherland wants to go down that path then he should call the man in charge of that team. Hesson never played first-class cricket but worked his way up the coaching ranks and was appointed by New Zealand Cricket in 2012, shortly after resigning as coach of Kenya because of security issues. One problem is NZ's longest-serving cricket coach is contracted until next year's World Cup. The former leg-spinner was appointed coach of his homeland in 2016 and played a key role in India's 19-Test undefeated streak and associated hold on the world No.1 ranking. He was axed last year because captain Virat Kohli wanted him out. Kumble's 619 Test wickets says plenty about his cricket brain. Hiring one of the protagonists in the "monekygate" saga would upset a lot of people and is unlikely to considered, but he'd be a handy trump card to play when India arrives in Australia for a four-Test series later this year. The side's bowling coach filled in as head coach during a ODI tour of India last year. Lacks the profile of some of the other names on this list, but has previously made it clear he would one day love to take the reins. The former wicketkeeper has been Australia's fielding coach for a tick over six months. Almost certainly hasn't served a long enough apprenticeship to get the top job, but his coaching skills are well regarded by many and - as the past week has proved - anything can happen. BEHIND THE SPORTS DESK: Can Smith and co bounce back? Are you interested in becoming a cadet? News The cadets meet in Nanango on Thursday evenings.